Habitat: The plant is native to Europe and Asia. It can be found in open fields, along roadsides and pastures. 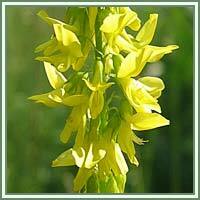 Description: Yellow Sweetclover is a herbaceous annual or biennial plant. It can grow up to 2 meters in height. It has erect, channeled and furrowed stems, usually pubescent near the tip. Leaves are alternate and compound, with oblong and serrated leaflets. Flowers are small and yellow, grouped in terminal and axillary racemes. 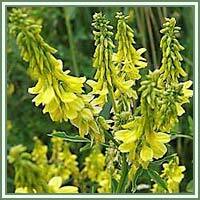 Medicinal use: Yellow Sweetclover is considered to be an antibacterial, anticoagulant, astringent, laxative, carminative and emollient. The plant is very helpful in removing gas from the digestive system and in inducing urination. It can improve blood circulation, and be of great help in treatments of varicose veins and hemorrhoids. It can also be helpful in treatments of wounds, cuts and bruises. Used in form of a tea, Yellow Sweetclower is beneficial in cases of nervous tensions, painful menstruation, insomnia and palpitations.